MED-DESIRE Final Event: Save the date! 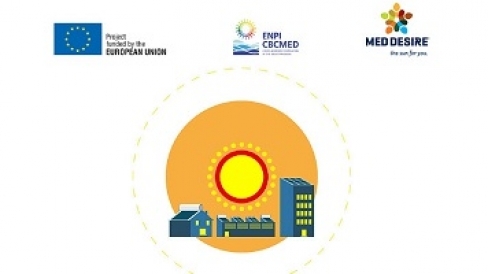 On December 18, starting from 9 am, Palazzo Colonna Coffee House in Rome (Piazza Santi Apostoli 67) will host "The sun for you: sustainable energy for the Mediterranean", the final public event of the MED-DESIRE project - MEDiterranean DEvelopment of Support Schemes for Solar Initiatives and Renewable Energies. The event includes four sessions that, besides showcasing the main results achieved during the lifetime of the MED-DESIRE project, allow top level representatives from national and international organizations to debate and share views on the perspectives of solar energy and energy efficiency in the Mediterranean countries. • David-Maria Sassoli, Vice-President of the European Parliament with responsibility on EU Neighbourhood Policy. The event marks the end of the MED-DESIRE project, co-financed by the European Union through the ENPI CBC MED Programme 2007-2013, which joins the efforts of nine partners from five countries, namely: Italy, Spain, Tunisia, Lebanon and Egypt. The Italian partners involved in the strategic project are: Puglia Region – Department for Economic Development, Innovation, Education, Training and Employment - Industrial Research and Innovation Office (Project Leader) and ARTI – Puglia Regional Agency for Technology and Innovation (implementing agency); the Italian Ministry for the Environment, Land and Sea; ENEA, the Italian National Agency for New Technologies, Energy and Sustainable Economic Development. MED-DESIRE has developed a strategic approach to the deployment of renewable energy and distributed energy efficiency in the target countries, working both in terms of stimulus to the sustainable energy technologies demand through the development of innovative financial instruments or proposals to change the sector regulation, and in terms of quality of components and systems, focusing on technological standards and training. The event is an initiative of Puglia Region – Department for Economic Development, Innovation, Education, Training and Employment - Industrial Research and Innovation Office (Project Leader) and ARTI, in collaboration with all project partners.